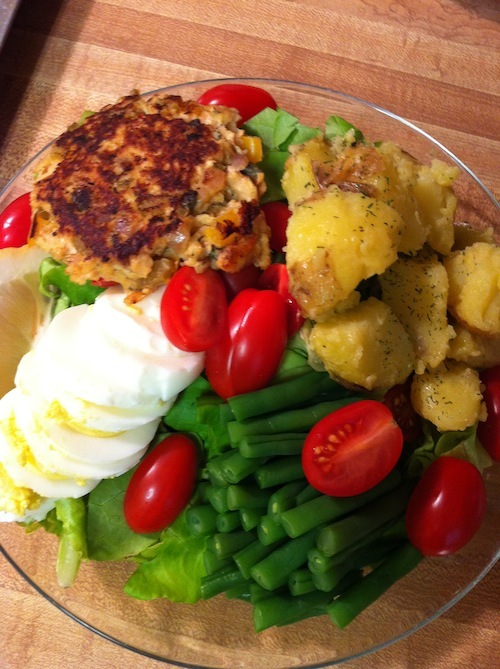 This updated salad nicoise uses salmon cakes instead of the traditional tuna. This is a great way to make a salad exciting, or a great way to serve either of these salmon cakes. Adding salmon cakes to the other traditional aspects of a nicoise salad, like potatoes, green beans, eggs, tomatoes, and olives makes this a great update. I also like to keep things flavorful throughout the salad, so after boiling the potatoes (when they’re still warm), I dressed them in a honey-mustard vinaigrette, that way each bite of potato is packed with flavor. Place washed potatoes in a large pot and cover with cold water and add salt. Cook over high heat, and let boil for about 15 minutes, or until fork tender. Remove potatoes from the water and leave the water on the stove. Add green beans to the boiling water and blanche for a few minutes until tender, then run under cold water to stop the cooking and keep the bright green color. Chop green beans into thirds. When potatoes are cool enough to handle, cut into large dice and drizzle with about 1/3 cup honey mustard vinaigrette. To assemble the salad, divide chopped romaine between plates. Add 1 salmon cake and sliced hard boiled egg to each plate, then divide potatoes, green beans, tomatoes and olives equally. Serve with honey-mustard vinaigrette on the side.